There are plenty of products out there that coordinate the posting, scheduling, and monitoring of your social media. We outline how to assess the software available so you can find the best ones for you. Social media management software can streamline processes and save your team time managing multiple accounts. How can you assess which product is right for your university's specific situation and future needs? Here are some questions to help with your assessment. How many people are involved in managing social media within the university? Social media software is priced on a user license basis, and some software handles workflow and user management better than others. Which social platforms do you engage with? Not all third-party software integrates with Snapchat, YouTube and Pinterest. The majority do, however, cover Twitter, Facebook, and Instagram. Do you need your software to manage the publishing schedule or intend to do this using another tool? Platforms vary in their ability to organize content and scheduling. If you are going to rely on your social media management software to organize your publishing diary the scheduling functionality needs to be user-friendly and feature-rich. Do you intend to publish all content through a single platform or will you handle specific channels separately? If you post natively on some platforms, you may need software with fewer integration options. What is your overall budget and how important is social media management in your digital plan? The more sophisticated software can be relatively expensive if you have many user accounts. Can you justify the investment within your overall marketing or digital budget? Do you have useful software co-ordinating your communications and marketing activity beyond social media? Some software provides an all-encompassing planning and implementation solution, which includes social media management, while others focus specifically on social media. How do you monitor social media activity and performance? While you can source insights directly through social media platforms, having data drawn from across all your social accounts into a single piece of software can be useful. Look for products that include powerful analytics and user-friendly dashboards. Do you have tools to track competitor activity? Some social media management software includes detailed competitor activity tracking, which can be invaluable for benchmarking and evaluating relative performance. Naturally, determining which social media management tool is right for your team needs a clear understanding of your requirements. Like any software procurement exercise, you'll only secure the best product for your institution's needs after some detailed research. Once you've selected a few potential software options, your team could try them to see how well they work in practice before implementing a final solution. 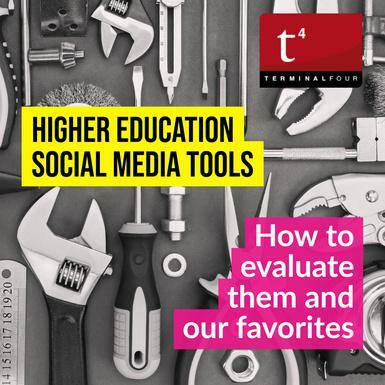 What are the most critical factors for your university in deciding on which social media software to implement? The volume of social interactions continues to rise each year across university platforms with students increasingly using social media as a communication channel. As a result, marketing teams are under pressure to handle a larger volume of social interactions. 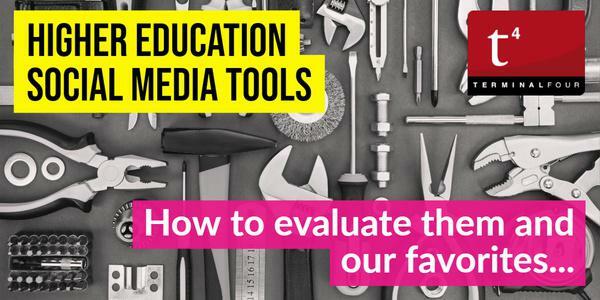 This is where social media management tools come into their own, making it easier for university teams to monitor, publish and engage with their followers. So whether you're assessing the quality of your current software or looking to implement social media management software for the first time at your institution, here are five top choices for social media management software. Buffer makes it easy for marketing teams to schedule posts, analyze performance and manage all their accounts in one place. If your institution handles lots of queries and support requests through social media Buffer could be well suited to your needs as it draws all these into a unified inbox for your team to efficiently handle responses. CoSchedule describes itself as ‘mission control for marketing teams,' and its remit is broader than social media. One of the most substantial areas of the software is the comprehensive marketing calendar, which creates a unified workflow for every project in a calendar for blogs, social, content, email, events and more. If you need software to manage full-scale marketing campaigns and social media activity in one place, and to coordinate the workflow around this activity, this could be a good option for your team. One of the most popular social media management tools out there, Hootsuite supports social media engagement activity across the student lifecycle. Through Hootsuite, institutions can potentially increase enrollment applications by listening for and engaging with prospects. Teams can enhance campus spirit through support orientated engagement. Following graduation, it can support fundraising efforts and lifelong participation by keeping alumni connected. The platform also offers an app directory of their software integrations. Oktopost is a comprehensive platform for social publishing, listening, and analytics. Its editorial calendar can provide a comprehensive overview of all campaigns and activity with a drag and drop interface. The CRM integrations are robust, with options to sync data with solutions such as Hubspot or Salesforce. An all-in-one platform, Sprout Social can help institutions find, form and deepen real connections with students and the broader university community. The software offers one of the most well-organized dashboards and in-depth reporting options. Additionally, your team can schedule the same message on multiple days without the need to individually input on the days required, and can bulk schedule posts using a CSV. Also worth considering in addition to these software options are tools which specifically work with Snapchat. Storyheap and Snapalytics are examples. They enable teams to manage Snapchat and Instagram stories and to gain insights into how they are performing. So, what is your institution's current position? We'd love to hear. What social media management tool (if any) do you have in place currently and how does it stack up against the options in this article? And is it better to use multiple pieces of software to get the best out of monitoring, engagement and publishing platforms or does a single solution streamline operations and better meet your needs? Are there any particular tools you recommend to other institutions?